After sweeping his European opponent Lewis Mackay 4-0 In a best of seven(7) series in Perth Australia. The duel was monitored by the Nigerian online news agencies at about 2:00am +1(west African ) on Sunday morning when it kicked off. The winner was set to emerge after seven consecutive wins against all odds to scale through to the Grande finale. emerging first in 32games Scramble Marathon to qualify for the duo Finals. 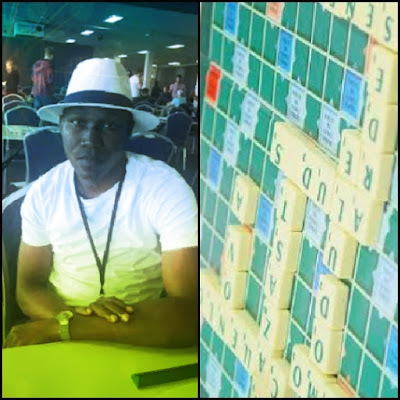 Jighere defeated his English counterpart in 4scramble games to become the champion. The Champion who had once come third in this World Scramble Marathon competition in 2007, never settled for less but worked more for the best. The Nigerian Scramble emerge the best team of the tournament with over six players in the top 50. With Ayorinde Seidu and Emmanuel Umujose placing 16th and 17th positions respectively. Suleiman Garba, the chairman of the Nigerian Scramble Federation(NSF) attributed the victory to dilligency and commitment.